Our little group met near the old Home Run Apple well in advance of the gate opening. And yes, it was a very windy day indeed. The weather forecast was for temperatures in the high 80's and possibility of scattered thunder storms. We were prepared for both sun and rain, armed with sunscreen and hats as well as rain ponchos and umbrellas, which pretty much guaranteed the rain would miss us. We stood in line for about half an hour waiting to enter the stadium through the Jackie Robinson Rotunda. One of fans in line ahead of us was wearing a customized Mets jersey that read Buckner with the number 86. Die hard fans will understand why that is amusing. It was Sports Bag Day, and the first 25,000 fans received these "lovely" bags. Once inside the turnstiles, we were on a mission to find Promenade Section 531 for the Guinness World Record Event, so we headed up the escalators to the left and kept going until we reached our destination. The organizers kept everyone moving efficiently - handing out the special Stitch N' Pitch bags, yarn and crochet hooks and getting us seated. As we were nearing the end of a row they asked for a couple of people to head up to the back of the section to fill a pair of seats, so Rich and I volunteered. Yes, you read that right - After weeks of telling me no, he decided to grab a hook and help break the record. He was lucky to be seated next to another husband, who said he felt he was discriminated against because they asked if he was here to crochet, but didn't ask any of the ladies the same question. The nice lady next to him helped instruct Rich how to chain and he even tried some single crochet. I was in the row in front of Rich and a few seats away from me there was another young man who was reluctantly chaining. Kudos to the deputized Guinness record observers for gently convincing him to keep going. It might have been easier to sell the guys on crocheting if the hooks had been blue or orange instead of light pink. The observers were very diligent in making sure that everyone in their assigned rows crocheted for the entire 15 minutes. 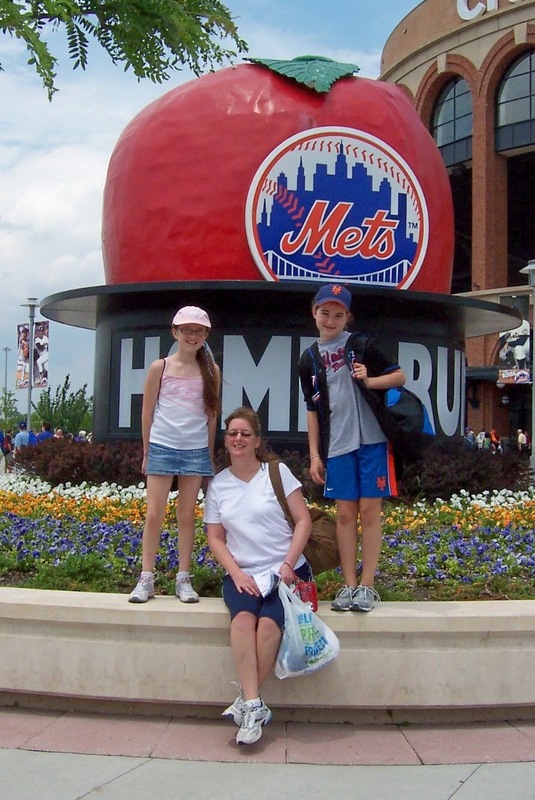 I don't have any pictures of me other than this one taken by the Mets photographers (I paid way too much for a single print and scanned it to add here). Rich was supposed to be in charge taking pictures during the event ... but we know how that turned out, don't we? Deborah Norville was the celebrity emcee and started us off. She also gave a quick demo on how to crochet for the beginners in the crowd. And so we crocheted for 15 minutes while listening to that typical, 70's style, time elapsing music (tequila!) and at the end we all counted down the final seconds and cheered. When it was over, we crossed over to our ticketed seats in Section 528. We were in the last row, but enjoyed it. The wind, though a bit strong, was cooling in the hot muggy heat. 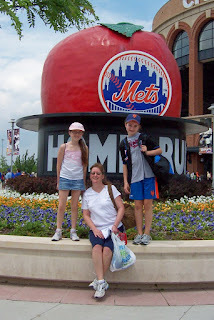 We had more than an hour before the first pitch of the game, so the younger girls in our group went to explore Citi Field and to try to get a player to sign a baseball. 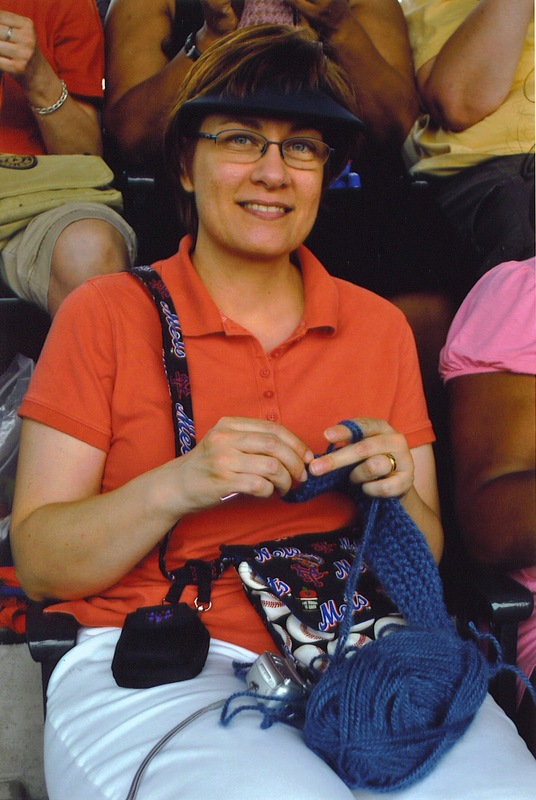 The rest of us relaxed and continued crocheting and knitting until just before game time. In addition to the Stitch N' Pitch tote bags, everyone with a SNP Ticket received a special Mets Skyline keychain. Can't you just picture this skyline image as a pattern for a quilt block? or a cross stitch design? The Mets scored early and often, and it seemed as if every rally started with a hit from Ike Davis. It was very appropriate that they played the Rolling Stones' "Start me Up" before each of his at bats. We all cheered for David Wright's home run in the 3rd inning and sang along to Take Me Out to the Ballgame during the 7th inning stretch. The game ended with another Mets home win and as we were making our way down the exit ramp a fan who'd obviously had a few Budweisers during the game was offering to buy somebody's sports bag. He'd arrived too late to the game and was bitterly disappointed to have missed out. 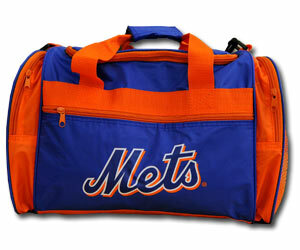 Considering our vast array of Mets freebies at home, Rich gave the guy his bag and told him to keep his money. He was so thrilled to get that bag, he shook both our hands twice. Now, if he'd asked for the Stitch N' Pitch bag, he wouldn't have stood a chance at one of those -- I'm keeping them both! Lion Brand Notebook: Setting World Records at Citi Field ... with Crochet! Hello, I am married to the husband that thinks he was decriminated against. We both had a great time and I helped your husband do the single crochet. The lady on his right that helped him do the single crochet, I will show her your blog being we work together. Did he make you a scarf??? lol Hope to see you next year. Hello!!! No - he didn't make anything from his yarn. He gave away the hook to our niece and the yarn to her cousin (both girls were with us that day). The girls spent all day chaining and last I heard they were up to 55 feet. Not sure what their plans are - maybe the world's longest crochet chain. lol. Maybe the could roll the chain in a circle and sew it like those old fashioned rugs. I wanted to let you know that inside editon showed the newscast of the Stitch n Pitch for Guiness Book of world records. When Deborah Norville says lets crochet she will flash to the back wall and I believe you will see Rich. I could see my Hubby and me and he was sitting next to us. Go on DeborahNorville.com. Her Blog has the video of it. Have a nice weekend. Great blog, it looked like so much fun. Thank you Donna for sharing your day.